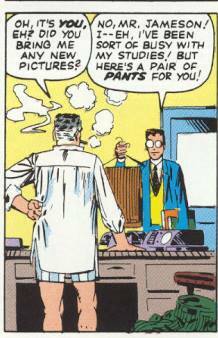 BEN: This is the first appearance of the Daily Bugle, Betty Brant, and the Sandman. 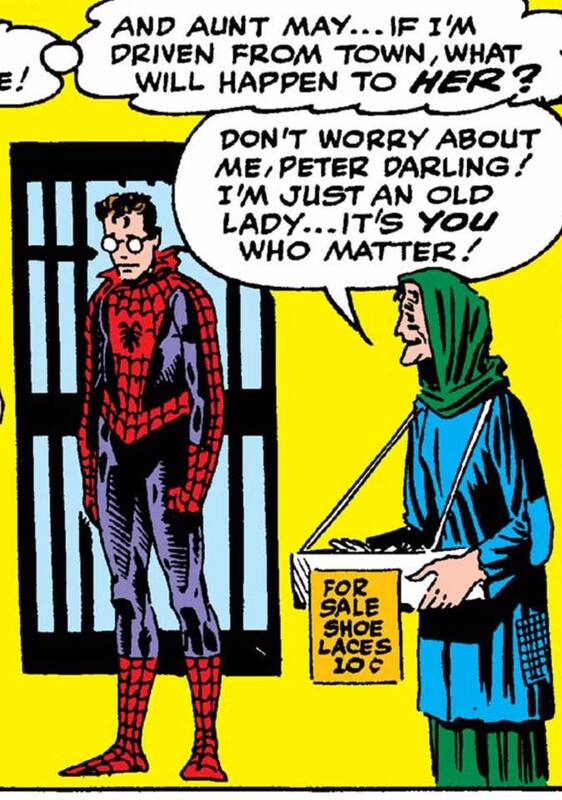 They count Amazing Fantasy #15 as Liz Allen’s first appearance, but she gets a name in this issue. DUY: It's the first appearance of the Steve Ditko haircut. 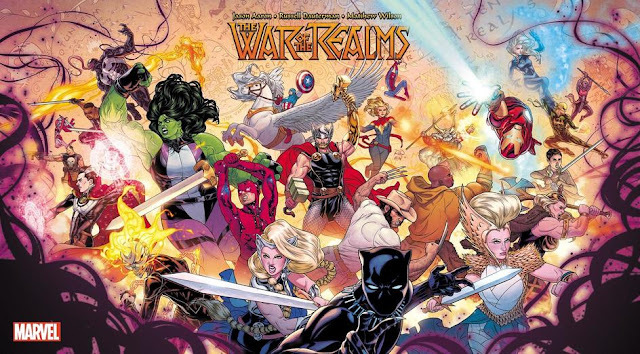 DUY: This has the first sighting of the half-Peter/half-Spidey visual. This isn't the iconic shot though, since this is half-Spidey in full body, while the iconic shot only has a half-mask. DUY: That can't have possibly be based on reality, right? BEN: I sure hope not. DUY: Mine is this. This is Ditko. 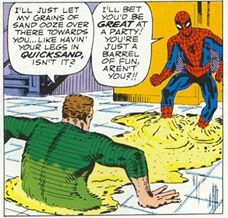 BEN: I always remembered Ditko having the look nailed down from the beginning, but it was still a little crude in places. It’s not like it’s ever bad in these early issues, it’s just not as good compared to later comics. DUY: Jokes like this never get old. 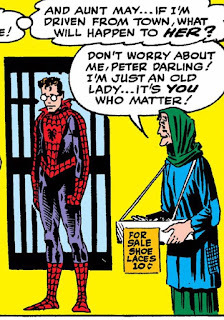 BEN: Like I mentioned last week, the teenagers being fully on Spider-Man’s side while everyone older is, at best, unsure of his intentions, and in the case of someone like Jameson, convinced he’s a menace and a bad influence. Adults frightened by what their kids are into is a timeless theme. 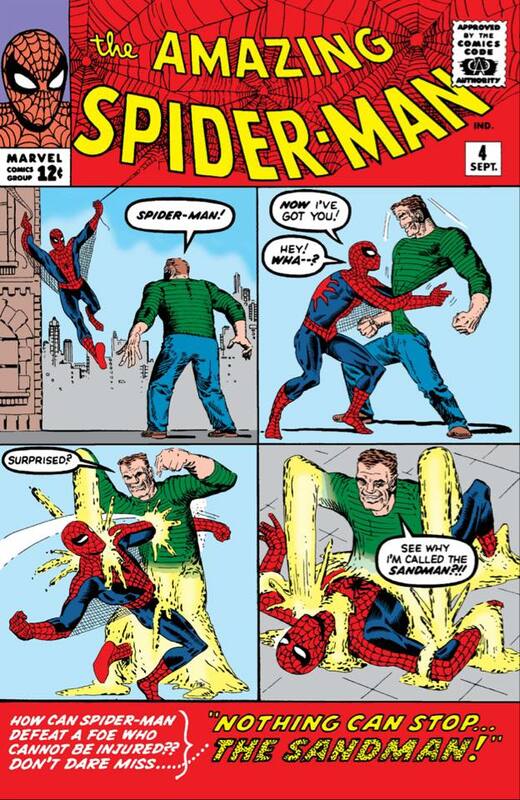 DUY: Peter Parker rationalizing the most unethical thing he's done so far — faking photos of fighting the Sandman — is very human, I think. BEN: Sandman’s power set is pretty inventive and provides for an unlimited amount of cool visuals. You can tell by the cover that it’s almost like they couldn’t decide which visual to pick. BEN: Sandman’s powers. Yes, I put this in both categories. What makes them cool also makes him impossible to defeat, so it’s always a really contrived scenario. BEN: I’ve tried not to reference outdated technology here, but there’s a lot of relying on television or radio broadcasts. Hadn’t discovered the patrolling aspect yet. BEN: Peter leaves webbing in JJJ’s chair and it lasts overnight. The 1 hour lifespan of his webbing hadn’t been established yet, but still. DUY: Why did Sandman have to form a fake key when he could just slide under the floor? BEN: The whole sewing his own costume angle is cute, but seems unlikely. Or not, maybe he’s a much more talented sewer than me. DUY: I know nothing about sewing, but I'm pretty sure you can't just sew together the mask the way Peter tore it. DUY: Allan comes off here as someone who wants to be Peter's friend and doesn't want to lose her social status. It's actually seeds for the future storylines. I'll give it to Liz. BEN: She does stand out in only a few short scenes. Even a little thing like telling Flash to ease up on Peter added some layers to her. 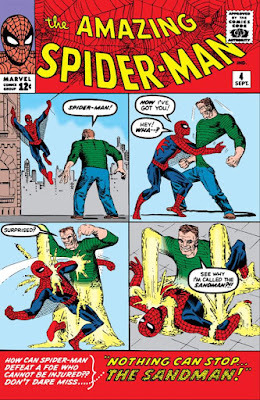 BEN: The comic begins with Spider-Man stopping three guys from robbing a place, before they start robbing the place. So they call the cops on him for harassing them. Again, it’s hard for us to put into context how different it must have been to read about a teenage hero constantly messing up, but it must have seemed so new and revolutionary. DUY: There's still no mention of Peter having been able to prevent Uncle Ben's death. BEN: Have we seen any mid-fight quips from him yet? Let’s keep an eye out for that.